You can add grid lines in units other than your map units using the Map Tools | Add to Map | Graticule command. Even though it is called “Graticule”, which by definition is latitude and longitude, you can still set the display units to other linear units like meters, feet, kilometers or miles. Your map does not need to be in geographical coordinates to use this feature, although it can be. For example, your grid could be in units of centimeters and you could add a grid in inches. Or, you could create a map from a grid in UTM meters and you wish to display a grid in units of feet. 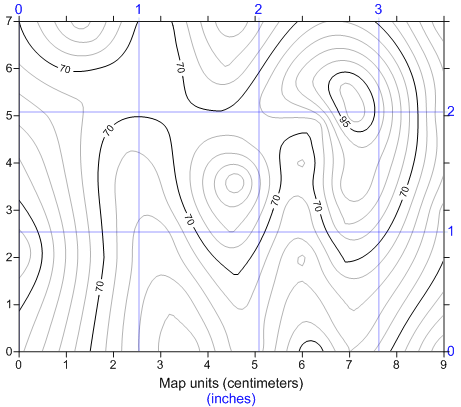 Create a map with a coordinate system. Click Home | New Map | Contour, select your grid file and click Open. In this example, you could select Demogrid.grd from the Surfer Samples folder and click Open. Surfer does need to know what coordinate system or units are defined in the grid file. Select Map in the Contents window and click the Coordinate System tab in the Properties window. Is a coordinate system already listed? Yes. Skip to the step 6. No. Click the Change button. Are the coordinates of the map geographical? Yes. Select the coordinate system for the map and click OK.
No. Define the units of the map. With Local System | Unreferenced local system selected, click the Modify button. Under Linear Units change the Name of the units to whatever units the map is in. Click the Add to Favorites button to add the unit coordinate system to your Favorites category (for future use) and click OK.
Now to add a grid, click Map Tools | Add to Map | Graticule. The grid is created over the map and you can see the new Graticule layer in the Contents window. By default, the units of the graticule are the same for that as the map. You can select the Graticule layer in the Contents window and click the General tab in the Properties window. Set the Units of the grid to any of the options, such as Inches. Now you have a map in centimeters and the grid displays units of inches. You can change any of the other graticule properties, such as line color, line spacing, label location and label format. Please see attached SRF file for example. See also our webinar Surfer Webinar: An Insider's View of Surfer 13's New Features, which includes a discussion of adding a graticule or grid to a map. In Surfer, in the Grid Data dialog, why doesn’t the Grid Line Geometry have exactly the same min/max as the original data?